With Strategic Corporate Sustainability, R. A. Fernando provides a snapshot of the industrial challenges to the planet and proffers a business model to effect positive change toward global sustainability. Fernando sees the current corporate focus on the fiscal bottom line as a major factor in the creation of environmental problems such as deforestation, water scarcity, poor air quality, and global warming. 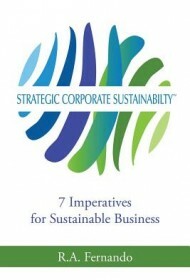 The corporate model he recommends to replace this current, environmentally destructive one would promote a “triple bottom line of economic, environmental, and social sustainability.” Under this new model, CEOs and board members would be directed to make sustainability a priority, and metrics would be put in place to measure a company’s success in reducing its carbon footprint. A corporate culture in favor of sustainability would also be encouraged, and greener production methods and products would be developed. In addition to his suggestions for corporate transformation, Fernando also supplies guidelines for government involvement in sustainability. Among them are directives for the removal of incentives for deforestation and fossil fuel production, and the creation of government entities to promote and monitor programs for national and global sustainability. Although the subject matter of Fernando’s book is highly relevant to concerns regarding environmental degradation, the author often gives repeated weight to catch phrases such as “blue oceans of green spaces” (environmentally correct business opportunities), rather than offering more in-depth analysis of this complicated subject. For instance, the author lauds Tesla’s creation of battery operated cars, but fails to discuss the environmental impact involved in the production of the cars’ lithium-ion batteries or the use of fossil fuels to produce the electricity to charge those same batteries. Hence, while Strategic Corporate Sustainability provides some valuable insights, thoughtful expansion would make it a more useful addition to the environmental discussion.